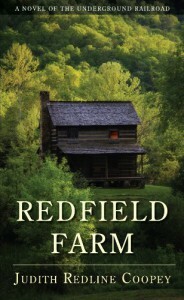 A sweeping saga of historical fiction, Judith Coopey’s “Redfield Farm” chronicles the life of Ann Redfield, a Quaker from rural Pennsylvania. Beginning when she was nine, in 1837, she realized that her older brother Jesse was aiding slaves on their trip to freedom along the Underground Railroad. She made a decision to help too, and her commitment to the cause of abolitionism proved her steadfastness and her compassion. She developed a special bond with one slave in particular, Josiah, and over the years she helped more than 150 slaves while also serving as a mainstay for her own siblings and her father. She experienced heartache, tragedy, and loss, along with joy, but through it all she remained resolute, leaving an enduring legacy. Told in episodic sequences, this story speaks to the love and care of familial bonds and to the ultimate simplicity of life. Coopey crafts a moving and poignant narrative rich in themes of friendship, loyalty, and sacrifice, and the straightforwardness of Ann’s story makes the reading flow quickly. The history that “Redfield Farm” encompasses is far-reaching and informative, from the Quaker lifestyle to the Underground Railroad to the Civil War and beyond. There are a few noticeable errors in the text, but these do not detract from the story itself. Fans of “Little House on the Prairie” and “Little Women” will relish this quietly evocative tale.